Bill Morneau said Canada is still negotiating in an effort to get the "unjust" U.S. tariffs lifted — but insisted it will be dealt with separately. OTTAWA — Finance Minister Bill Morneau says he's hopeful the newly struck North American free-trade deal will be signed ahead of next week's deadline — and suggests Canada could sign even with stinging U.S. tariffs in place. Morneau made the remark Thursday in a speech as he was talking about concerns he has been hearing from the business community about trade. "Of course, that situation was improved when we signed the new NAFTA — or when we will sign the new NAFTA, I hope, next week," Morneau told the audience, referring to the new United-States-Mexico-Canada Agreement or USMCA. The countries reached an agreement-in-principle on the trade pact, which, if ratified, would replace North American Free Trade Agreement. They want the deal signed before Dec. 1, when a new president takes office in Mexico. After his speech to the Economic Club of Canada in Ottawa, Morneau was asked whether the government should still consider signing the new continental trade deal if the United States keeps its heavy import taxes on Canadian aluminum and steel. Morneau said Canada is still negotiating in an effort to get the "unjust" U.S. tariffs lifted — but insisted it will be dealt with separately. "Our approach has been to make sure that we have a stable and confident business sector to make investments and that means that we need to sign the new NAFTA that we got to, which is a good agreement for the future of our three economies," Morneau told reporters. At the same time, he acknowledged Canada has to address the "challenging" steel and aluminum tariffs as well as an ongoing dispute over how Canada manages its softwood-lumber industry. "Those are ongoing and critically important issues that we are working with Americans to solve," Morneau said. "We are not going to make one set of negotiations contingent on the other and, most importantly, we want the stability of a new NAFTA that we've been able to deliver for Canadians." Morneau also said there's work going on behind the scenes to make sure the legal document defining the USMCA is exactly as agreed. He added he has every reason to believe the work is moving along at a good pace. The USMCA, agreed to after 13 months of negotiations, is scheduled for what Canadian officials have said will be a low-key signing when the three countries gather next Friday for this year's G20 meetings in Buenos Aires. Trade tensions that flared up during the talks have yet to subside, largely because Canada and Mexico both remain subject to the Trump administration's tariffs. Canada responded with levies of its own on imports from the United States. Sources close to those ongoing discussions have said Canada and the U.S. remain a long way from reaching any sort of an agreement, and expect American talks with Mexico to go down to the wire before the end of next week. The Liberal government has faced pressure from the opposition not to sign while the tariffs persist. Morneau's speech came one day after he released a fall economic statement packed with billions of dollars worth of tax incentives for corporate Canada. Ottawa's long-awaited plan to help the country compete with the U.S. for investment dollars comes in response to major American tax and regulatory reforms that many in the business community warn has eliminated Canada's edge as an investment destination. The biggest commitment among Morneau's tax changes would enable businesses to immediately write off the full cost of some types of machinery and equipment, and allow companies of all sizes and in all sectors to expense a larger share of newly acquired assets. Falvio Volpe, the head of the Canadian Automotive Parts Manufacturers Association approves of the tax break. 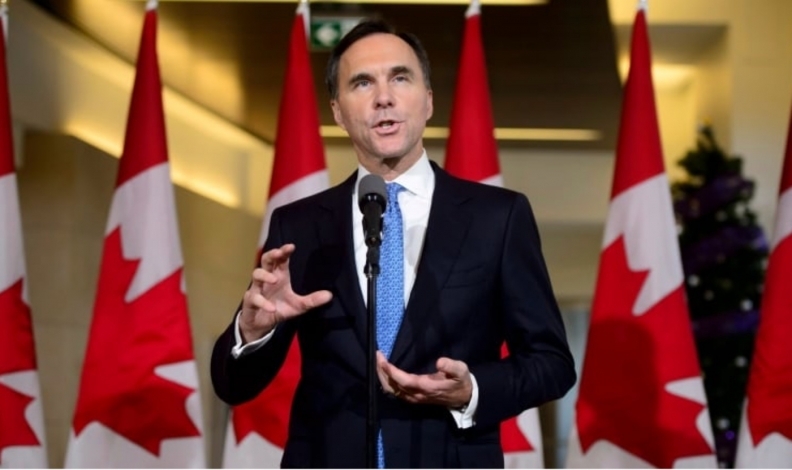 A stronger economy has given Ottawa about $22 billion in extra fiscal room over the coming years, compared to what federal forecasters projected in last February's budget, thanks to a combination of higher revenues and lower expenses. But the new initiatives will use up all that space and also contribute to slightly larger-than-expected annual shortfalls, beginning next year. The fiscal update contains no timetable to eliminate the Liberals' deficits that are now forecast to be higher than $18 billion in each of the next couple of years. The government has drawn almost daily criticism from the Conservatives and some economists for not providing a timeline for balancing the budget, especially with the economy running close to full strength. There are warnings the government could face a very difficult fiscal situation when the next economic downturn arrives. Following the 2015 election, the Liberal government ditched vows to run annual deficits of no more than $10 billion and to balance the books by 2019. Instead, it has focused on reducing the net debt-to-GDP ratio — also known as the debt burden — each year.